Shas resigns from the committee working on the new draft law, cites disagreements regarding sanctions on hareidi draft evaders. Shas chairman MK Aryeh Deri announced on Monday that his party will resign from the Shaked Committee, which is working on the new draft law that would see hareidim enlist in the army. 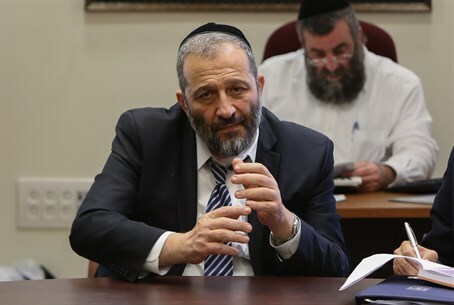 Sources in the party said that Deri will recommend to the Council of Torah Sages that the party no longer send its representative to the committee’s meetings. Shas was represented in the committee by MK Ariel Atias. These sources explained that the inability to reach an understanding with other members of the committee regarding the criminal sanctions on hareidi draft evaders caused Deri to give up and resign from the committee. The issue of punishment for hareidim that would evade draft under the new law has been a point of contention among the members of the Shaked Committee. The Yesh Atid party strongly favors criminal sanctions and its chairman, Finance Minister Yair Lapid, has threatened to bolt the coalition unless the new draft law includes criminal penalties for hareidi draft evaders. The religious Zionist Jewish Home party opposes criminal sanctions as well. Last week, the Jewish Home’s Avi Wortzman, who serves as Deputy Education Minister, pointed out that the coalition agreement to which Lapid is bound specifically states there will be no criminal sanctions against those who evade draft. Last week, Prime Minister Binyamin Netanyahu declared that he is against sending yeshiva students to jail, putting him on the side of the Jewish Home party and against Lapid.